Findings have shown a vast majority of entrepreneurs significantly overpay their taxes due to simple mistakes that can cost them dearly. Without a good understanding of the laws, it is easy to overlook many of the deductions available to you and your business. The first step in saving taxes starts by merely keeping an organized record of your yearly expenses and purchases. The second step is working with a professional who can inform you of the multitude of deductions you are missing out on. And what perfect timing it is, as we celebrate 45 years of serving our clients! It is a true honor to work for and learn from a man who has provided so much value to the lives of hardworking entrepreneurs all around the world! Learn more about Len's business advice by using the link below to access the article. 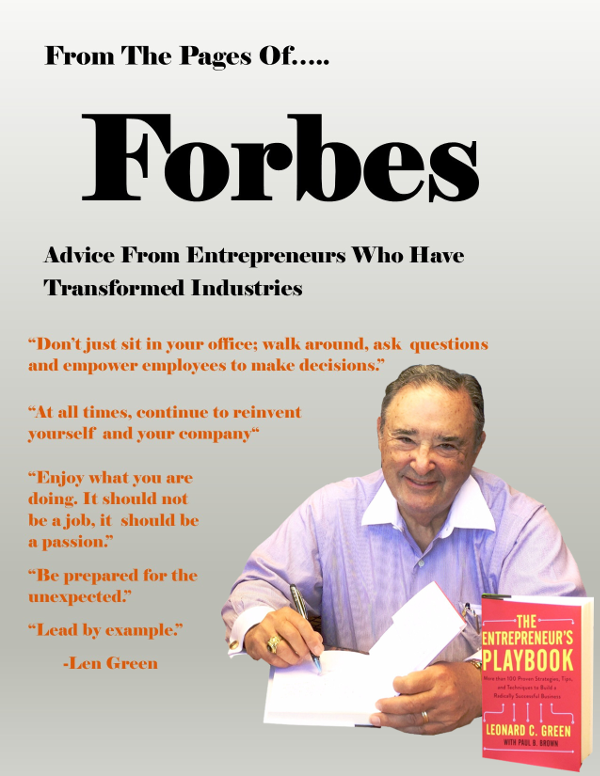 Coming March 2017, Len's book, The Entrepreneur's Playbook, will launch. You will have ALL of Len's strategies, tips, and techniques right at your fingertips. Read more about CHECK OUT THIS VIDEO OF LEN GREEN LECTURING AT THE GSCEN BOOT CAMP! Read more about The Green Group Food Drive! Read more about Valentine's Day Fun Facts!